While some experts say as many as 40,000 lions once roamed West Africa, a recent wildlife study estimates that just 400 remain - largely pushed out of natural habitats and now fighting for survival in just four protected parks across the region. Colonel Kane estimates that there are about 100 of them left at the Niokolo Koba National Park, but the global wild cat conservation organization Panthera says that's outdated and puts the number at just 16. 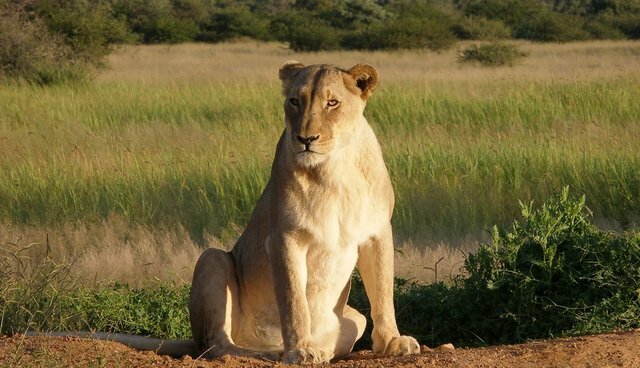 The nation's wildlife officials have joined with Panthera, the wild cat conservation organization, to promote new protections for West African lions, but enforcement has been a challenge. For one thing, many nearby villagers continue to graze their cattle on land reserved for lions' prey, essentially leaving lions' food without food -- and potentially wreaking havoc on the entire ecosystem. Studies have already shown that when large mammals are left without food and disappear from an ecosystem, the number of rodents and diseases increases dramatically. But Phil Henschel, Panthera's Lion Program Survey Coordinator, told Voice of America that regardless of the costs and challenges of enforcement, Senegal is running out of excuses for failing to protect its share of West African lions. Nearby Burkina Faso and Benin have successfully led the charge fighting over-grazing and poaching -- and even bigger threat -- to conserve 90 percent of West Africa's lions. Senegal can follow their lead. "Those two countries are seriously investing in lion conservation and protected area management in general," Henschel said, "and it's paying off." Poaching and wildlife trafficking -- like that of Africa's lions, as well as elephant and rhino poaching, the fur and skins industry, and exotic animal trade -- is driving many species to extinction. Use #EndPoaching on Twitter or Instagram to speak out. "[rebelmouse-campaign #EndPoaching target=1000 increment=500 twitter_share_message=""Join me and pledge never to buy endangered wildlife products and to help save animals from poaching #EndPoaching"" call=""**Sign this petition** or share on Facebook, Twitter and Instagram with **#EndPoaching**"" theme=dodo] "